Big Melons! That was how pumpkins were once described when they were noticed growing in North America. Here are are ten facts about everybody's favourite Halloween foodstuff. The holder of the world record for the largest pumpkin ever grown is Joe Jutras of North Scituate, Rhode Island, USA. His huge pumpkin weighed in at 1,689 pounds (766 kilograms) at the New England Pumpkin Grower's Association weigh-off on September 29th 2007. The previous record holder was Ron Wallace who held the record from October 7th 2006 with his 1,502 pound (681 kilogram) pumpkin. After setting the record, he probably spent the next year eating nothing but pumpkin pie. Large pumpkins aren't actually that tasty. If you want a pumpkin full of flavour, go for a smaller one! So, although people like Mr Jutras and Mr Wallace enjoy growing large pumpkins, they probably don't get as much pleasure out of eating them. Pumpkins can be grown in every continent in the world apart from Antarctica. Evidence of pumpkin seeds about 7000 to 9000 years old have been found in Mexico, but it is believed that pumpkins originated from North America, which is by far the biggest pumpkin-growing country in the world. 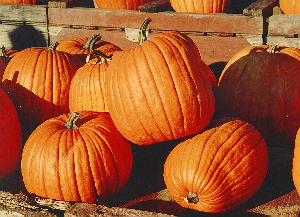 Morton, Illinois is the largest producer of these North American pumpkins. Despite most pumpkins being grown in Illinois, the pumpkin is actually the state fruit of New Hampshire. Every year, the Pumpkin Festival is held in Keene, New Hampshire where local residents attempt to break the world record for the largest number of pumpkins lit at the same time. After the festival, the pumpkins are donated to pig farmers. Presumably, they are for the pigs and not the farmers. This link will take you to the official Pumpkin Festival website. Unfortunately, it's too late to attend this year's festival as it took place on Saturday 25th October. Years ago, people believed that pumpkins could cure freckles and snakebites. How? Apparently, you cured freckles by mixing ten pounds of pumpkin with two spoonfuls of honey and a small amount of salt. You rubbed it on your face, and your freckles were gone! Well, they were still there - it's just that your face was covered with orange mush and you couldn't see them. And snakebites - cured by throwing the pumpkin at the snake before it had chance to bite you? Who knows? Pumpkins are low in salt and contain no cholesterol. Well, not unless you're using them as a freckle cure then you have to add salt. 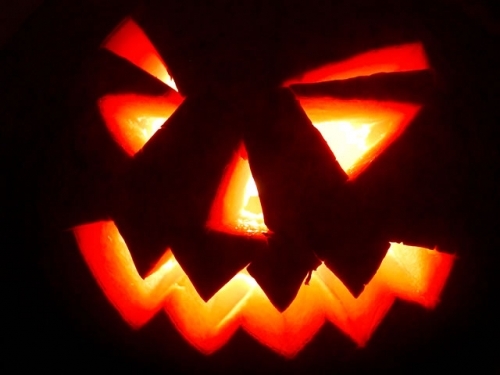 The act of carving out pumpkins and using them as lanterns, or Jack-o-lanterns, dates back to ancient Irish beliefs. Many centuries ago, on October 31st, Samhain was a festival held throughout what is now the United Kingdom, itself a precursor to what we now know as Halloween. It was celebrated as a way to mark the end of the summer harvest season and the start of winter. The Irish used to carve out turnips into frightening faces. They would light a candle or put a smouldering coal into their "turnip head" and place them outside their houses to scare away evil spirits, or to welcome their lost loved ones to their house for the Samhain festival. The tradition continued when Irish immigrants settled in North America, using the common pumpkin as an alternative to turnips. Why are pumpkins called pumpkins? In 1584, French explorer Jacques Cartier reported seeing "gros melons" (big melons) in St. Lawrence, North America. These big melons were named "pompions", a French translation of the Greek word "pepons" (which means big melons) and then translated into English as "pumpkins." Pumpkins are an extremely versatile fruit and can be used for a variety of different meals. They can be used to make soup, pies and bread. Pumpkins were once used as an ingredient of pie crust, rather than a filling. The flower of a pumpkin is edible, as are pumpkin seeds which can be eaten as a snack when roasted. Because of the nutrients contained in pumpkins (as well as being low in salt an cholesterol, they also contain potassium and Vitamin A and are 90% water) they are processed and used as animal food. In popular fiction, pumpkins are often connected to the supernatural. Witches apparently turn people into pumpkins. In Cinderella, a giant pumpkin is turned into a coach by the Fairy Godmother, and later turns back into a pumpkin after midnight, and in the Harry Potter novels, Harry and his friends seem to have a penchant for pumpkin juice.